*Legacy was co-owned with Niki's Grandmother J.R. Lathrop until her passing. We have been slowly building our classic breeding herd as we have found animals that would fit our strict criteria. 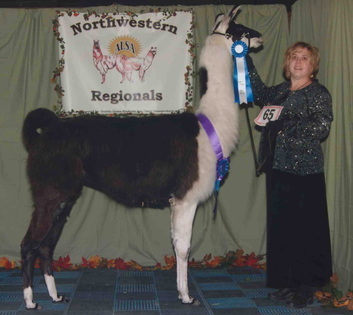 Our goal is to produce conformationally sound classic style llamas that can pack, perform and do well in halter. This is not an easy task given the current lack of breeding stock with classic coats and sound bloodlines. We try to keep our animals under 47 inches at the withers because our experience (years of tracking bloodlines and traits in lines) has been that once you get over that size, most llamas get too clunky and broken down. In the Summer of 2007 on a visit to Bobra Goldsmith's Rocky Mountain Llama farm I was pleased to find a whole herd of classic style llamas. At that time we already had Rocky Mountain Sunshine and were happy with her. I immediately noticed a nice classic style female in Bobra's herd who turned out to be Sunshine's dam, Supaya aged 22. The next animal to catch my eye was a beautiful black and white classic, who turned out to be Sunshine's younger sister and Supaya's daughter by Inca. After some begging, Bobra agreed to let Legacy come live here at JNK and the rest was history. Legacy in a year and a half racked up 15 Halter Grand Champions in light wool. She ended 2008 at the ALSA Grand Nationals as National Reserve Grand Champion Light Wool Female. Bobra was extremely proud of this girl, which makes her even more special to us! We thank Bobra for her willingness to sell this beautiful girl. We always get a good chuckle from llama people that think they have HUGE llamas and don't know how to properly measure their llamas. When most people see Legacy, they tell us she has to be close to 48-50 inches tall! Legacy was accurately measured at 46.5 inches tall at the withers. RETIRED with 15 Grands, 1 Reserve Grand & 1 National Reserve Grand Champion in Halter! 2016 Female by Anders Tobias "JNK Tobias's Toviah"
2015 Male by CTL Sulu "JNK Sulu's Finlayson"
2013 Female by CTL Sulu "JNK Sulu's Lena"
2012 Male by Anders Tobias "JNK Tobias's Tobin"
2011 Male by Anders Tobias "JNK Tobias's Baker MT"
2010 Female by Anders Tobias "JNK Tobias's Stella"
2009 Female by Anders Tobias "JNK Tobias's Kahkneeta"